HAWK Center is: Helping Arkansas Wild "Kritters": And MORE Bats! Again, we were called out to the same spot for more baby bats on the ground. Since it was the third call from the same place, I ascertained that the site has a problem! I decided to investigate. Upon arriving, several individuals came out to meet me and showed me the bats all over the ground at the apartment complex. Some pups were clinging to the wall for dear life. There was an obvious nesting roost two stories up and plenty of feces on the ground below. The stench of a nesting colony could be smelled from the ground. I evaluated the situation and the babies. They were all very dehydrated and would surely die if left there. I gathered them, four this time, and set off to bring them to a bat expert. En route to the bat man in Little Rock, Joel Dunaway, the bats chattered the whole way. I was assured by their chattering that they were still with me, but very hungry and upset. I also took the time to call the manager of the apartment complex, who detailed to me that the colony has lived here for four years and eradication has been attempted before. She agreed that we could make an attempt to intervene, hoping to evict the colony. 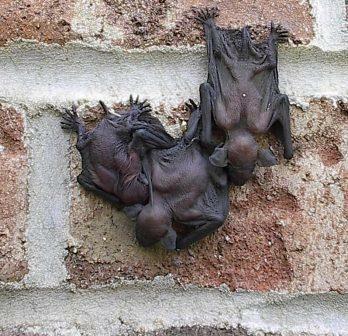 Their residence here is not only a risk to the bats, but also a health risk to the paying residents. Joel will come up on Saturday and we'll see if we can't figure out some solution. We haven't yet determined the species of bat, but there was a deceased and desiccated adult on the ground near the babies. It's large size lead me to believe they may be Big Brown Bats. We'll see what these little ones turn in to.